Sometimes with material handling, all you need is a little push in the right direction. The Power Tug does just that for carts holding up to 3 tons. Nu-Star’s vice president of material handling spoke with us about how the company handles the design process as smoothly as the Power Tug moves its loads. The materials you need to move around come in all shapes and sizes. There’s usually no one-size-fits-all solution, as your workers also come in all shapes and sizes. Automated guided vehicles can be employed, but why go through all the magnetic red tape and go full robot when all your team needs is a little power boost? That’s exactly what Nu-Star Inc. offers with its Power Tug. The battery-powered electric tug assists in pushing or pulling up to 6,000 lb., and includes a fully programmable control system that adjusts speed and momentum based on the load and environment. 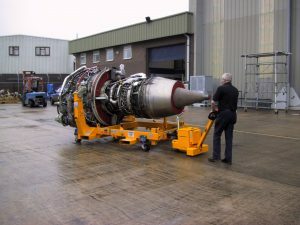 Each unit is engineered to work precisely with four wheeled carts, even those with four swivel casters. The housing is 18 ½ x 24 ½ x 19 ¾, and the front leg configuration can be modified in several ways to make maneuvering heavy carts around corners easy even for your workers who don’t bench press sedans in their off time. Ryan Blesi, vice president of material handling for Nu-Star Inc., talks about why the Power Tug may fit perfectly into your material handling plans. Your Power Pusher line can move up to 50,000 lbs. and has been around since the ’70s. Why was the Power Tug created? We get into numerous applications where there are four swivel casters on a cart. And controlling that with a Power Pusher is next to impossible because the opposite end of the cart from where you are connected always wants to roam the way the casters are going if they are swiveled. The Power Tug was built in 2000 to handle carts with swivel casters. The leg that comes out front has a fixed caster on it. If that leg goes to the halfway point of the length of the cart prevents the runaway of the other end of the cart, so you’re able to connect to the load and move that cart and control it with that fixed caster in the middle. Also, it’s great for facilities where space is at a premium. The body only sticks out 2 ft., as opposed to 5 ft., which is a big difference. Besides capacity and size, how else are the Power Tug and Power Pusher different? The Power Tug has hooks positioned on a hydraulic or electric actuator that raises up and grabs onto the frame or some other portion of what we’re moving. Also, the unit is an indoor type of machine, where the floors need to be good. 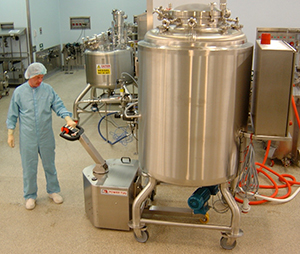 The largest industries that use it are dairy, food, pharmaceuticals, hospitals, warehouses, and some manufacturing. What are some improvements you’ve made to the original design? 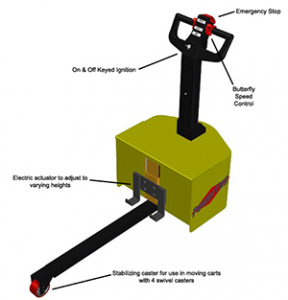 The big improvement is the hydraulic actuator we can build into the unit, and can speed up the lifting mechanism. The other thing we found is sometimes we need to go to a dual leg system, instead of a single. Lastly, we now can use this on carts with two fixed and two swivel casters, due to the innovation of the breakaway caster that we can put on the front. The real innovation is in the customized attachments for each client. It’s how we can handle different carts. For instance, we have a new attachment that grabs form the side, which provides the advantage handling different types of carts. How does your engineering team go about that customized process? When we get an inquiry, we send out a questionnaire. It is important for us to understand what the surroundings are. Are there bad floors, are there good floors? Are there a lot of turns to be made? Is there a big guy using it? We also ask them to send pics of what they are using. From that we can get 90-95% of what the final solution is going to take. We engage in web conferencing, where they can see CAD models, and see it move in three dimensions. Once they sign off, we build it to spec and send it out to them. We’re confident in our equipment, we let them work with it for a couple weeks. If they demo it for two weeks, and don’t like it, they can return it by paying for return shipping. Our closure rate on demos is 90%, which means are engineering team is successfully analyzing the solution correctly. It’s nice to get that affirmation that we’re moving in the right direction.